Jeff Powers (Phillips) is an LAPD detective known for his aggressive streak. Rather than be a detriment to his career, it enables him to join the SIS, or Special Investigative Section, an elite team of cops given a wider berth to take down repeat criminal offenders by any means necessary. The group is led by Dan Vaughn (Glenn), a charismatic but violent man. Other members of the team include Angel (Divoff) and, as Larson, Yaphet Kotto in one of his best roles we’ve seen to date. As Vaughn and his ethical issues become darker and murkier, Powers, spurred on by his reporter girlfriend Kelly (Field), becomes wary and spirals into a moral conundrum - remain true to his brotherhood and its camaraderie - after all, they ARE stopping crimes, or, blow the whistle because their crime-stoppery knows absolutely no limits and at times comes with a very high price? What will Jeff Powers do? 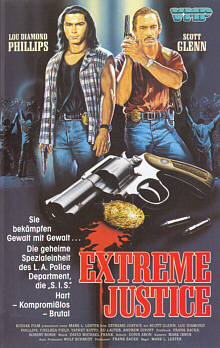 There are a lot of really good things about Extreme Justice, starting with its title. This was before “extreme” things became the norm. The SIS gets EXTREME justice. But besides that, it has a top-notch cast, and the excellence of fan-favorites LDP, Yaphet Kotto, Andrew Divoff, Ed Lauter and Scott Glenn raise the bar considerably. The movie has back-to-back scenes of awesome cliches (someone should invent a word that means “cliche” but doesn’t have a negative connotation, because that’s what we’d use here) - everything from a female BYC (Black Yelling Chief), to Jeff Powers being called “A Loose Cannon” - but Extreme Justice really does provoke thought, as well as conversation with whoever you’re watching it with. We talked about the fine ethical line some of the characters walk - and Powers, Vaughn and others deal with their issues in their own ways. We also talked about the nature of law and justice and things of that nature. This movie really does bring them up, which is more than you can say about a lot of other cop dramas of this type. Plus it has Yaphet Kotto dressed as a cowboy complete with hat, belt buckle and six-shooter. The ubiquitous Ed Lauter’s role here (as well as the plot of the movie) is a precursor to the great The Sweeper, 1996 (note the “Cloak and Dagger” business card), and Scott Glenn’s role as Vaughn also is a precursor to another career-best role as Cole McCleary in The Last Marshal (1999). This is a manly movie about dudes who drink at bars, go to strip clubs, and shoot their guns at their steak-fueled cookouts. But this Brotherhood Movie, as we call them, has an uglier side and themes of adult peer pressure are explored. Try to imagine a cross between the TV show The Shield, The Last of the Finest (1990) and The New Centurions (1972). Now add to the mix the L.A.- based cop dramas of James Ellroy such as Dark Blue (2002) and Street Kings (2008), and you have an idea of where this movie lives. Director Mark L. Lester, who has given us such gems as Showdown in Little Tokyo (1991) and Commando (1985), delivers a refreshingly-adult drama, a far cry from the stupidity of his later Hitman’s Run (1999). Here, there are no stupid, wisecracking teens or kids. 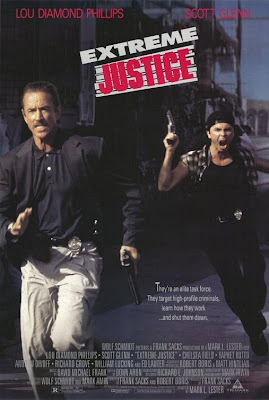 Extreme Justice is solid and recommended. Also check out RobotGEEK's review! Nice review..robotGEEK did it, too...just now...lol...coincidence? Thanks! What a weird coincidence! before....Explosive Action posted a review of Snake Eater at the same time as us a year ago or so. Haha. Whoa! Ha, that's so funny! Looks like we both enjoyed this one, and deservedly so. It's a pretty good straight up cop thriller with an awesome cast. Yaphet Kotto in cowboy getup?? I had this in my queue "forever" and finally sat down to watch it last week. lol. Glad I did, it hit the spot. Great review guys! Totally agree, Yaphet Kotto as a cowboy was a hilarious sight to see! I love pretty much all of the actors in this one, especially Kotto, but couldn't get into the movie. All the characters were really two dimensional and it reminded me of Training Day which I saw first. Oh well, maybe I'll give it another watch in the future. 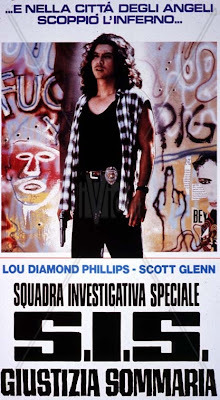 The makers of Training Day stole everything they know from Extreme Justice including Scott Glenn! Haha. For me, Lester's worst films were Blowback(third-rate serial killer thriller), The Ex(lame Fatal Attraction rip-off, though Yancy Butler was pretty good) and Misbegotten(just incredibly mediocre and forgettable) compared to those, Hitman's Run looks pretty good. Definitely want to see End Of Watch. Looks like a good thriller. Totally agree about Blowback and Yancy Butler. She almost saved The Ex. love this film. great action scenes and lou diamond phillips and scott glenn together: awesome.. Happy you love it too. Glenn and LDP were a good team. They should make another action movie together. Too bad LDP hasn't done a film since the incredibly mediocre Striking Range. Thought Striking Range wasn't bad. LDP saved it. He should be making more action flicks. Less Sci-Fi. I watched this on Netflix earlier this year while wasting away in Afghanistan and I came away very impressed. I was surprised how brutal and unflinching this film was, especially the raw language and violence. The scene where the woman is raped and the team just sat back and waited for it to happen was way out there. When done right crooked cop films are some of the best and this ranks as one of them. Totally agree. This was a solid and gritty cop film. There should be more movie like this. We get one once in a while....for example Street Kings or Narc. I thought Phillips was good as the stereotypical Indian in 'Renegades' alongside Kiefer Sutherland. That film is prime 80's rude action fare in the greatest traditions. Totally agree! Kiefer and Lou made a good team. Renegades was a solid 80s action flick. We will have to review that one day.